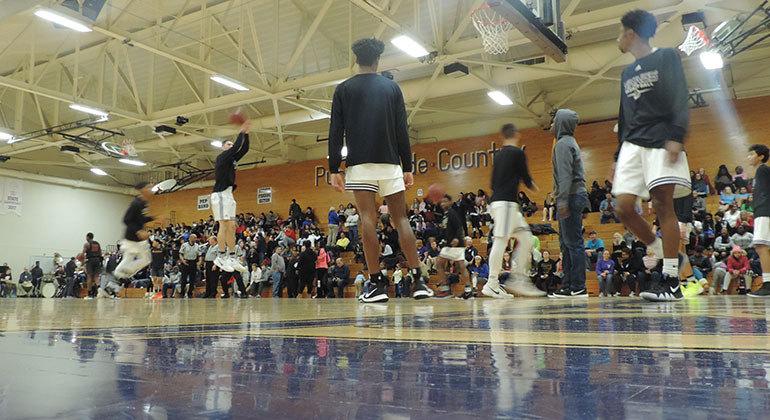 The Parkway North boys varsity basketball team warms up before a hard game against Ritenour. Junior basketball player Elijah Hill shoots for a basket. 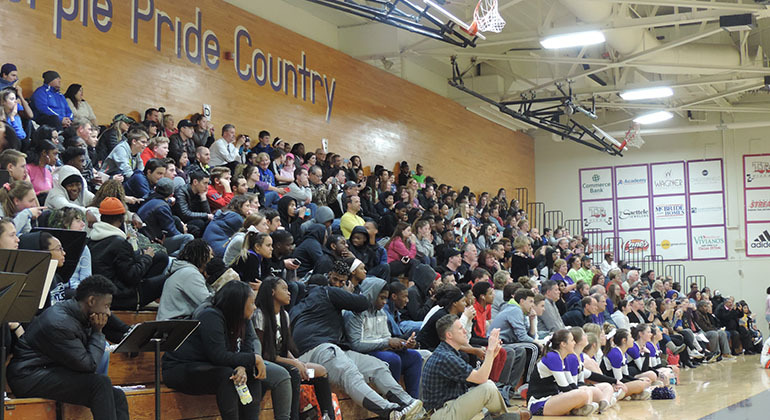 On Feb. 2, Parkway Norths gym was flooded with students, parents, and faculty as they raised awareness for cancer and cheered on the Parkway Norths varsity basketball teams as both the girls and the boy’s teams played against Ritenour. During the game, people came in colored shirts, each color cost $15, to support a different type of cancer. “I picked the black color because it’s for Melanoma cancer. I have actually heard some really good survival stories of Melanoma, but I’ve also heard some really horrible ones so I thought I’d support,” said junior Jordan Welge. The crowd watches eagerly as the Mankettes perform during the halftime. As the Mankettes dance as the Vikettes would many audience members found it entertaining. As the crowd cheered for the Vikings and for cancer awareness, spirit squads got the crowd involved. The Vikettes performed their annual girl-guy dance, with Parkway North male participants are called Mankettes. As time passed, the girl’s varsity team beat Ritenour by 60-27. The fight song began and the Parkway North varsity cheerleaders performed along. It was a special night for the pep band as well, as last Friday night was their 8th grade band night. “It was a lot bigger than normal. The incoming freshmen really boosted the spirits of the band members,” said sophomore band member, Derrick Brown. Unfortunately, the night didn’t end on a happy note. The Varsity Parkway North boys basketball team lost 46-62 to Ritenour.